I have now patched everything to the extent that I am happy with, the back of the boat isn’t exactly perfect but I would end up with a boat that is all filler to get everything 100%. I suspect that somewhere along the way the boat has had a solid bang in the back and put everything off kilter. 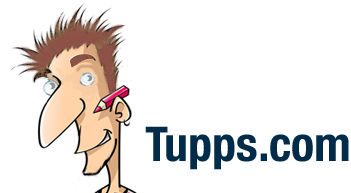 To do it properly would require replacing the stern with a new piece of plywood. Something to put on the list of things to do next time! 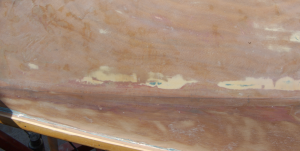 The boat has been sanded with 150 grit sand paper, and the various parts of the boat either fibreglassed or filled with epoxy filler. 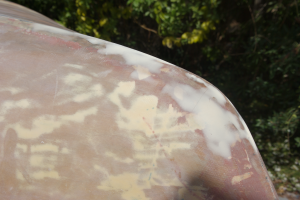 The marks you seen on the boat in the above photo is either undercoat under the fibreglass on the bottom of the hull, or undercoat that is deep in the grain of the wood. 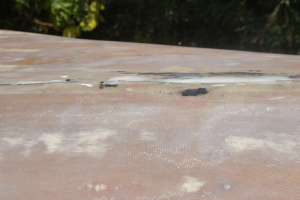 The front of the boat had quite a few bumps and a fair bit of the fibreglass was cracked. This has been replaced and filled with epoxy filler in places. The whole in the side of the boat has been replaced by a new piece of plywood. This has been fibreglassed in place then filled around the edges, to form what is hopefully a smooth side to the boat. 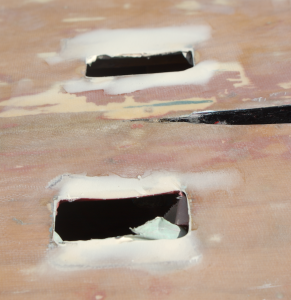 The back of the boat has filled in the dints and holes from the different sized pintles used on the boat. The back isn’t completely smooth but a lot of filler would be reqiured to cover up the problem, and I suspect it won’t change the performance of the boat. 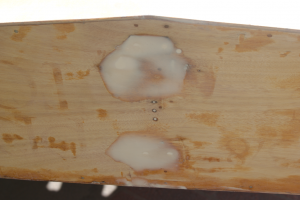 As I said above to fix this properly would require removing the entire sheet of plywood on the stern of the boat and replacing it. The self bailers also required a bit of work, filling in where I had removed the fibreglass to get to the screws. These will be drilled out when they are put back into the boat. At the front starboard hand side the glass had a few cracks in it, and some of the glass along the keel of the boat had also been damaged over time. Both these areas had been sanded back and the fibreglass replaced. The next stage will be painting the boat. 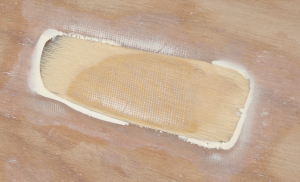 Hopefully the weather plays nice in the next couple of days and I will be able to at least get a couple of undercoats done before New Years Day.